Investing in gold coins is a smart idea for many reasons. This is a brilliant way to keep your money safe and possible even to see its value increase over time during recessions. Gold will always maintain its value and by investing in gold coins, you get the added advantage of having a piece of artistry that you can actually hold and admire in your hand. This makes it an easy investment choice – as you can buy as much or as little as you need – and it means there are no fees associated with storage, transport or withdrawal. The Canadian Maple Leaf is a particularly stunning choice of gold coin that is truly remarkable to look at and to hold and that is perfect for collectors and investors alike. With a great premium over spot price, this is a particularly good option for those starting out as well. Read on and we’ll take a more in-depth look at the Canadian Maple Leaf 1/4oz Gold Coin. The Canadian Maple Leaf 1/4oz Gold Coin gets its name from the design on the front of the coin. As you may already have guessed, this design features a stunningly-detailed maple leaf, which is situated right in the center of the coin and that has a particularly high level of detail. It’s easy to make out all the crinkles in the leaf, all the veins and more and it has a very large and imposing presence. On the reverse is an image of Queen Elizabeth in portrait. She is looking to the right and features a slightly less hyper-real design that is very striking and attractive. This is a simple design but it’s also one that really makes an impression and is instantly identifiable. 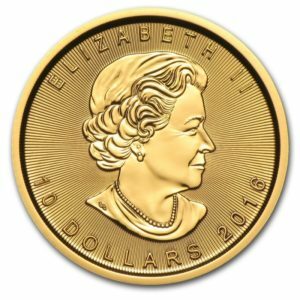 This is one of the big factors that has contributed to the popularity of the Canadian Maple Leaf 1/4oz Gold Coin and that has resulted in it being such a great choice for investors and collectors. This coin is a very popular gold coin that has been selling incredibly well since it was first designed in 1979. Since then, it has been selling nearly as well as the leading gold coins, including the highly popular American gold buffalo and gold eagle. As a ‘classic’ coin for investors, it is a safe and reliable choice. The Canadian Maple Leaf 1/4oz Gold Coin trades for a premium that is higher than its weight in gold. This is entirely due to the artistry on display and on the high quality of the design. This is both a collectible coin and a pure gold coin that will rise and fall in keeping with the price of gold. This purity – which is guaranteed by the Royal Canadian Mint – also means that it is highly popular in European and Asian markets. So far the coin has it all: the looks, the purity and the collectible nature. But it also has another advantage right now, which is its great price. This is a result of the huge demand that led to so many of the coins being printed. This makes it a great choice for anyone just looking to get started in gold investing and for anyone who would like to make a big investment with lots and lots of coins. It’s also popular in retirement accounts. Making life even better for investors is the hard plastic tube that the coins come in. These are capable of holding 10 coins each and make it very easy for you to transport and stack the coins without any risk of them getting damaged or lost. The gold coin comes in a range of sizes, with the 1oz being highly popular. The ¼ ounce is a little less common, making it an even wiser choice for investors and at the same time ensuring that you will be likely to get it at an even better price. This is no doubt one of the best choices for a gold coin investment and this is a great time to invest in gold coins full stop. With the economy currently going through such a traumatic and unpredictable period, this is not the time to be making speculative bets on stocks and shares. Investing in gold is one of the only ways to ensure that your money stays safe and to give it the best chance of growing as well. What’s more, investing in gold coins means you get direct ownership of your assets. This is one of the only types of investment where you can truly say that and when the coins in question are so sought after and highly designed, it’s actually quite a treat to be able to admire these as well. The Canadian Maple Leaf 1/4oz Gold Coin is an excellent investment and a stunning gold coin!